The restoration of natural ecosystems – “rewilding” – ought to be a chance to create inspiring new habitats. However the movement around it risks becoming trapped by its own reverence of the past; an overly nostalgic position that makes rewilding less realistic and harder to achieve. The recent launch of Rewilding Britain is certainly exciting and timely. However George Monbiot’s vision of bringing back 15 iconic species falls short of the rewilding visions being discussed in universities. These are emerging from advances in functional ecology and Earth system science. The vision of rewilding is more ambitious: it is about restoring ecological processes through reassembling the species that drive them. 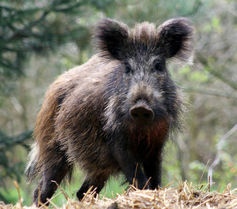 For example rooting by wild boars has repercussions throughout a woodland ecosystem. Such animals shouldn’t be reintroduced simply because they were once there, but because they could do something productive in future. Monbiot’s quest to restore “lost” species harks back to a past age. However many conservation scientists are more relaxed concerning the question of “nativenes”. They are willing to consider introducing non-native species if they contribute a functional role in ecosystems, and they view the past not as a benchmark to preserve or replicate but as an inspiration for ecosystem restoration. For instance, “Monbiot’s 15” omits the auroch and tarpan which are classed as extinct. However in the 1980s progressive Dutch ecologists realised that their functional analogues survived as cattle and ponies and their ecological role could be restored through “de-domestication”. 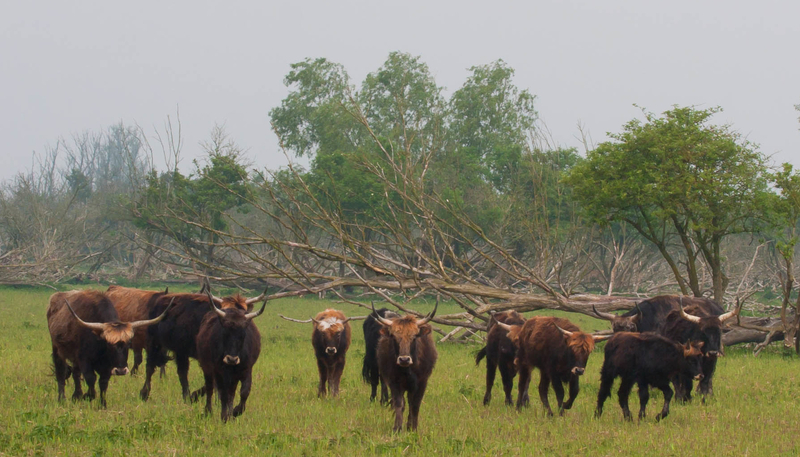 They set about de-domesticating them at the famous Oostvaardersplassen reserve located a 40 minute drive from Amsterdam. This produced a “Serengeti-like” landscape: a type of nature unknown to Europe since humans settled down and started farming. The auroch (or ‘heck cattle’) is king of the OVP. The OVP, as it is known, made nature conservation political again and has become a landmark public experiment in ecology. I first visited it with a group of students in 2003 when we travelled to the Netherlands to meet the radical ecologist Frans Vera and engage with the controversies created by rewilding. The OVP is created on reclaimed land and opponents argued that the fences and flood control created an artifical landscape that undermined any claims to its authenticity as a restored ecosystem. More seriously the policy of allowing the cattle and ponies to die of “natural” starvation enraged animal welfare and farmer groups who believed they should be subjected to the same welfare standards applied to animals in labs, farms and zoos. The controversies surrounding the experiment, Vera’s hypothesis that Europe’s original vegetation was wood-pasture rather than high-forest, and other radical rewilding visions are inspiring a re-examination of the fundamental premise of nature conservation. I recently published a Rewilding agenda for Europe in the journal Ecography, as my contribution to the European Council’s “fitness check” of its nature legislation. The Birds and Habitats directives under review derive from the science and policy context of the 1970s. They are ageing. Both science and society have moved on. Any revisions to European nature legislation should support the creation of experimental rewilding sites. Across the UK we could imagine the creation of wild cattle and pony step-lands on the Ridgeway, wild boar and deer-driven woodland ecosystems in Wales, and a Scottish arcadia of bison, moose, wolves and pine forest. We also need many more OVP-like public rewilding experiments close to urban areas. These would be contained sites that inspire and inform the public about scientific advances, and provoke us all to ask: what sort of nature do we want for the future? Rewilding might offer fresh solutions to intractable conservation problems. For example, conservationists want to remove pine trees introduced to the Sefton Coast dune system near Liverpool but local residents love them for their scenic grandeur and red squirrels. The famous Formby footprints dating from 2,500 BC show that humans, wild cattle, deer and wolf once inhabited these coastal areas. Suggesting the reintroducing of wild cattle and companion herbivores and seeing what happens might prompt a unified vision for the dunes. In practice rewilding is constrained by regulations on biohazards, public access and animal husbandry – and rigid and powerful 20th century conservation legislation and agencies which have no real incentive to innovate. Conservation institutions need to modernise but no one wants to dismantle them and start over. We need designated spaces with regulatory flexibility – experimental rewilding sites – where we can plan future natures that will improve the quality of life for people and the planet. Ordinary people are disenfranchised. Conservation policy is influenced by a coordinated lobby of a few big charities who have built their organisational models on the institutional structures of the late 20th century. George Monbiot’s vision catches the attention but advocates of rewilding need to develop realistic policy mechanisms to take their ideas forward. Rewilding experiments would give space for wider reflection and debate and give our conservation institutions time to adapt. Crucially they would reinvigorate conservation as a cultural force in the 21st century. Paul Jepson is Course Director, MSc Biodiversity, Conservation and Management at University of Oxford.